Many thanks to my testers Virginia and Patti M. Couldn't do it without you. 10/29/09 Correction to row 3 of collar. NOTES:1. Read through all instructions before beginning. 4. Sleeves and cap may be made without turnings, but then it won’t be a 100% match to the body of the sweater. 5. Set in photo made with Lion Brand Pound of Love. Row 24: Turn, slipstitch in first dc, skip next dc, 5 dc in next dc, slipstitch in next sc, * skip next dc, 5 dc in next dc, slipstitch in next sc. Repeat from * across. Do not fasten off. Round 3: Ch 3, turn, 2 dc in same st as join, skip next dc, sc in next dc, *3 dc in next sc, skip next dc, sc in next dc. Repeat from * around. Join with a slipstitch in top of ch 3. Rounds 4-13: Turn, slipstitch in first sc, ch 3, 2 dc in same st, skip next dc, sc in next dc, *3 dc in next sc, skip next dc, sc in next dc. Repeat from * around. Join with slipstitch in top of ch 3. Sleeve is approximately 6 inches from underarm. Rounds 15-17: Ch 1, Do Not turn, sc in each st around, end with slipstitch in first sc. Round 7-10: Turn, slipstitch in first sc, ch 3, 2 dc in same st, skip next dc, sc in next dc, *3 dc in next sc, skip next dc, sc in next dc. Repeat from * around. Join with slipstitch in top of ch 3. Lovely set, just lovely. Thanks for your generosity in sharing it! Suzie, I love your stuff and this set is no exception. Thank you for the beautiful designs and your generousity in sharing them with us. Try Suzie's Textured Baby sweater (link on the right hand side bar), It is constructed the same way but with a gender neutral stitch. Try it in Camo or a nice blue. Or better yet RED, I always dressed my boys in red when they were young. Susie, thank you for the sweater set pattern, the direction where easy to understand. I finish the sweater in one day.Everyone just loved it. You should have a book of your designs! They are beautiful and so much easier to make than most pattern books. 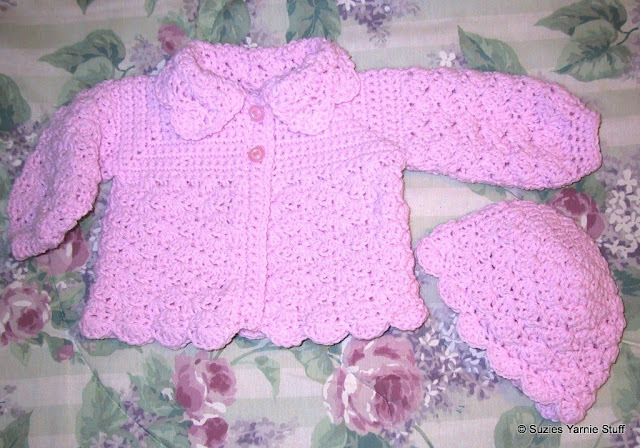 I made the outfit and hat (added my own embellishment to hat) and also a blanket...for my doctor's new baby. LOVE the pattern..Will be making it again..soon! This is my first time crocheting a sweater - how do I go about doubling the size of this sweater? Any help is appreciated! You can email me at tlynn99@hotmail.com. Thank you so much - I am really looking forward to trying this pattern, it's beautiful!!! I don't know what size it would turn out, but you could try a bulky yarn and appropriate size hook. If you do try that let me know how it turns out. Beautiful, but I am confused about one part. After the buttonhole band, the last note to transition to the button band: after I have 37 neckline stitches, I am at the last bend, with 8 stitches to go before I am at the front. Do I fasten off, or did I misunderstand something? Thank you! I hope to get this because I really love it! You shouldn't have 8 stitches leftover. But since you do, go ahead and sc in those and then work the button band. That will make the neckline bigger and you will need to work more stitches for the collar. Thank you for such a lovely pattern.I embellished thevhat with a small crocheted flower. Just a lovely pattern. It's beautiful. Do you have the pattern for bigger sizes? Thank you. Sorry only the one size.